He suggested that the companies could have talked about a potential acquisition, but noted that larger companies talk with smaller companies about possible deals "on a daily basis." Initially, Mike Butcher reported on Wednesday that Apple was "sniffing around Waze." A similar rumor also appeared on an Israeli website. Waze is a popular iOS application that the company says has more than 30 million users. It allows users to share real-time information on traffic congestion, gas prices, accidents, speed traps, checkpoints and more. 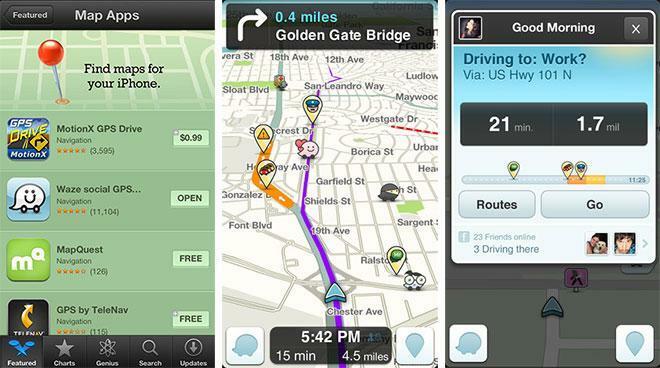 The Waze application for iOS was highlighted by Apple in September as an alternative mapping option on the App Store. Apple began promoting competing applications after users complained that its new Maps application in iOS 6, which replaced Google Maps data with its own proprietary service, was substandard. The poor perception of the new iOS Maps was originally believed to be a driving force behind Apple's supposed interest in Waze, but with Thursday's report it's now said that such a deal will not be happening.